In a year where analysts have had to prove their worth to fight back against the reduction in discretionary spend, we would like to applaud those companies and individuals who have shown a commitment to providing a service that goes above and beyond what is expected. This series of blog posts will showcase the results of the recent ‘Analyst of the Year Survey’. The results of this survey were collated over a three month period during which time 137 AR pros responded to a questionnaire available on surveymonkey. In case you are wondering, the highest accolade of “Analyst of the Year” and “Analyst Firm of the Year” will be announced in the second post in this series. *NB. Not enough data was collected on “important consumer analysts” to make the results confident. Note – this post refers to ‘importance’ NOT analyst of the year which will be covered in the next post. When I compare the results from last year there seems to be a significant trend to the larger international houses. 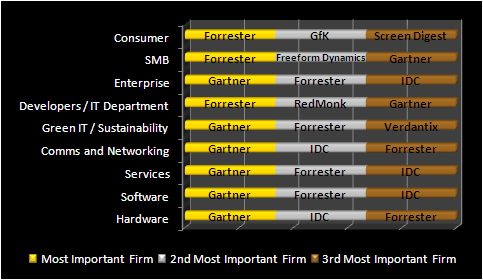 Gartner, Forrester and IDC seem to haul in the majority of opinions as to which firm is the most important. Perhaps it is of little surprise that firms are cutting back and focusing on the analyst houses that have the greatest global reach. However, it is somewhat refreshing that other houses also are listed and have managed to carve out their own niches – notably: Verdantix and Quocirca in the green IT space and RedMonk and MWD in the developer/ IT Pro sector. It is in these smaller, areas where ‘boutique’ firms have managed to push their own USP and become sector leaders. Whether this was by choice or accident, I don’t mind but perhaps this is a new trend that we should monitor. It is also worth giving a special mention to both AMR and Ovum who between them seemed to just miss out as they both made a high number of 4th places. There is a partial correlation between analyst house importance and analyst importance with a few significant exceptions. Most notably where people attach more importance on the individual rather than the company. This could be because of the bespoke value they give to firms and their unique intelligence and insight. 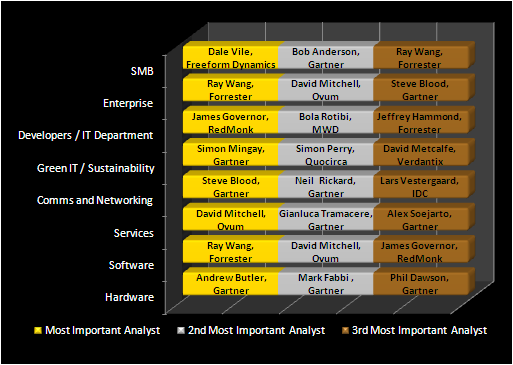 Notable analysts who fall into this category include David Mitchell from Ovum, Ray Wang from Forrester and James Governor from RedMonk. Being recognized by your customers is always an honour, especially when the recognition comes from the IIAR and its members. Being recognized in enterprise, software, and services is especially gratifying. Even though the IIAR is based in the UK, the fact that new chapters are opening up around the world is testament to the fact that this survey was truly global in its reach. At first analysis, I was immediately concerned over the relatively high number of awards that have gone to EMEA-based analysts and firms thinking that this was due to the physical location of the voters. Brand, sales coverage and processes (to ensure the quality, independence and exhaustiveness of the research) are universally important. So is the impact that an analyst firm has on deals. Individual traits include: bringing unique insights to the table, being easy to deal with, delivering value to end users and vendors with each interaction, and understand user needs whilst providing tangible real world benefits. 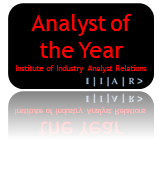 In the second of this series of blog posts, the coveted “Analyst of the Year” and “Analyst Firm of the Year” will be announced. This survey was open to anyone who works in analyst relations in any country, either in-house or at an agency/consultancy. In order for someone’s entry to be validated, they had to submit their email address and company name to verify they not an impostor trying to distort the results. This personal information will not be distributed or used beyond sending copies of the results to all participant. The survey was open for specific period of time and IP addresses were taken to ensure that someone could not vote twice. What makes a good analyst event? Dissapointing that your survey asked for inputs across all regions but you excludeAsia Pacific from the final results. This award doesn’t seem to have reached a global level yet. As it happens one of the options for respondents was to vote for AsiaPac. Out of those people who submitted entries from within those countries preferred their vote to count on a global as oppose to regional basis. What’s more there was not enough people left after this to make me confident that those who did only vote for AsiaPac were of sufficient number to create a sub segment purely on this geography. Hopefully next year, this will not be the case. Just a quick note to say thanks to those who voted for the recognition – it really is appreciated – and congratulations to all of the other analysts and firms called out. Thanks from me too ! Dale, very well said. Thanks to all as well! Jonny, you really stepped it up this year, with a much richer and very interesting paritioning of the data. It’s great to see the winners getting the recognition they deserve – kudos to them all! Big props to the 137 respondents form AR organizations around the world. And to the rest of you – you know who you are – don’t you think it’s time you joined the community as a participant, not just a watcher?